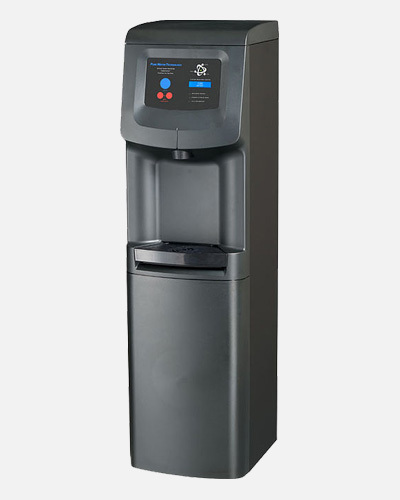 PHSI Pure Water Technology’s newest system eliminates the environmental and workplace impact of bottled water systems while supplying FRESH, PURE and HEALTHY drinking water at the point-of-use. The 3i delivers glass after glass of pure drinking water at the touch of a button while keeping our world and your workplace healthy. At the core of our technology is a microprocessor that controls and monitors activate oxygen injections, filter life, water quality and all other system functions 24 hours a day. Only the 3i delivers this level of programmability and performance that keeps your water fresh and pure. Oxygenates the water during the injection process, delivery pure and fresh water. Notifies you when the filter needs replacing by our service team, ensuring the highest quality of freshness. Illuminates dispense area (4 brightness options) to easily identify drip try "bulls eye" for precise dispensing-keeping the work environment clean of water spillage.